Salisbury Model Centre's web site no longer focuses on online selling- there are enough web shops already out there doing that. Instead I hope you'll find these pages of general modelling interest. You'll find lists of new arrivals in store and you are welcome to telephone the shop to order or reserve an item or make general inquiries. More detailed reviews of kits and accessories will also be posted here or on 'you-tube'. Non modelling information that is of interest will also be posted such as Steam visitors to Salisbury or news and manufacturer announcements. TRADE NEWS (last edit 13 01 18) :click here. EVENTS :click here. REFERANCE PHOTOS :click here. click Facebook, notices and wider updates. click to view SMC videos. Already i've doubled the posts on my Blog from last year. Having a 'snow day' helps. I'm stuck at home, so using the time well. 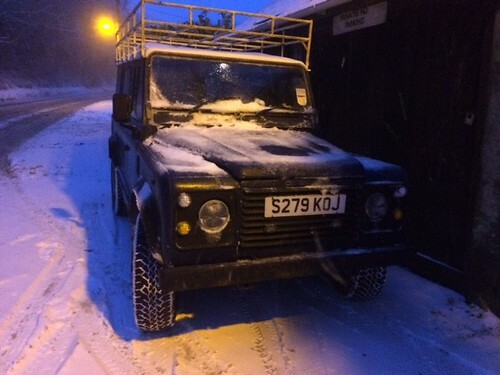 I could get into the shop as my Landrover is capable, and this time last year it proved itself by getting me home after the snow came down heavy. It was the day of Mr David Groves (Endless Models) funeral and on leaving the Crematorium the snow was already pretty deep so I offered to take some mourners home. After a few drop offs it became clear that while I could traverse the snow covered roads, the main problem was blocked routes by cars that couldn't or jack knifed lorries. I was forced to take the Avon River route through Durnford that took a lot longer, and resulted in a few hairy moments as the snow was so deep a bench that was completly hidden from view became an obstruction as I pulled over to let another 4x4 pass. It didn't help that I was dressed for a funeral, smart ( read slippy ) shoes and a suit, rather than boots and a warm coat. So today i've shown scense and took the RAC advice - 'Don't start out'. As it is still coming down I think that was a good call, but sorry to any shop visitors. So what else to write about, maybe modelling stuff, I mean this is the Blog of a model shop? A left over from last year was the help we gave to the renovation of the huge model of Salisbury Cathedral that sits in a glass case inside the Cathedral itself. I'm not sure if Boshirov or Petrov got to see it but millions of other visitors have, and due to its age it was looking a bit tired and many of the orginal lights had ceased to work. The site team who were to renovate the model asked for some help in matching the finish on the buildings that are situated around the Cathedral as it is constructed, both in colour and texture. I carried out a few experiments and was able to provide a solution. I have yet to see the completed renovation but will find time this year. Other work done for other people includes a quick paint up for 'Fields Of Glory' (whose products we sell). 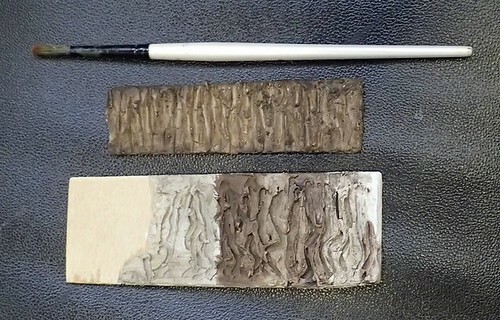 A new base consisting of walls and road bed as 3 parts had been produced but without any supporting artwork. I was glad to step up, basing it on Basra in Iraq, it didn't take long to colour and complete. The next few builds to look back on are sci-fi orientated and produced for my annual trip to Belgium for Plastic and Steel in Affligem. I always look forward and therefore look ahead to going to IPMS Belgium's show, 'Plastic and Steel'. I like to take part in the contest as, if i've made the long journey why not? It's not any expectation of winning but just nice to take part and have others view my efforts. It is an extremly friendly show with many european modellers remembering me and my wife each year. In Febuary I think about how long I have to devote to a new project. No pressure as its months until October. Normally all that happens is the time slips away and those plans amount to very little. 2018 was pretty much the same. But the spark for the model I did take came from a different reason. As many know I try very hard to get unusual Sci-fi kits into my shop, and I was chuffed to get Hasegawa's Mechatro-wego kits into the store. These are highly engineered models but they do look odd. In fact so odd that we didn't seem to be selling any. I decided to make one up, put a personal twist on it and mount it in a diorama setting. 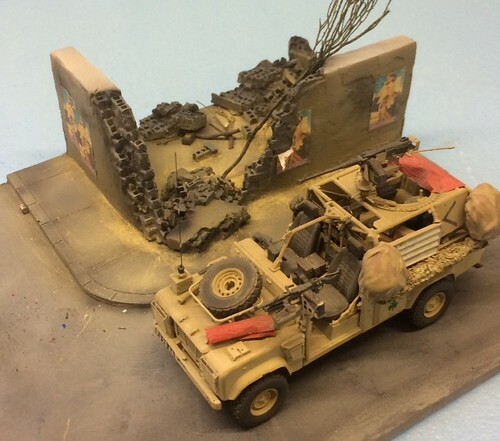 The twist was in re-scaleing from 1/20 to 1/35 and giving the model a distinctly German WWII feel by adding Zimmerit, tools, jerry cans and weapons. 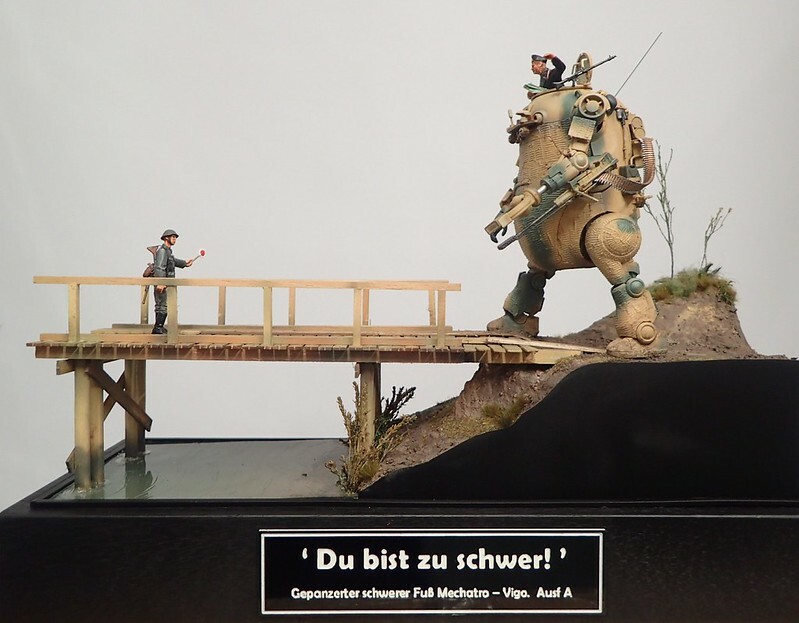 It was meant to be a 1947 era Mecha being stopped on a bridge. The traffic cop is equipped with the type of items in development by the Germans for equipping their troops if the war had continued. The model did the trick, with potential customers seeing what the kit actually looked like and it's potential. I also ended up taking it to Belgium where it did very well. I also made in just 3 days a model i've had knocking around my head for a long time. 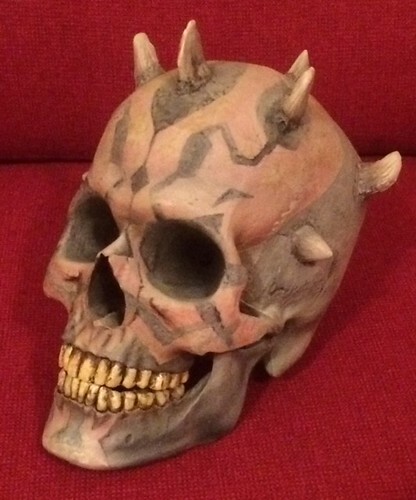 In fact this contributed to the speed of the build as i'd processed many times the steps i would take to make a skull as if belong to Darth Maul. Obviusly biologically incorrect, I wanted to hint at his tattoos having stained his skull. The base kit is the skull from Lindberg, with Milliput horns, and some filler for bad joins. At one point I though i'd ruined it but switching from using an airbrush to stippling with a paint brush saved the day. Proof if needed that airbrushing dosn't always result in the best finish. That's it for now. I was going to write a paragrah concerning Nitto and Ma.K, more sci-fi goodness but maybe that's an incentive for next months Blog. Be safe, Dec at SMC. Last year my Blog writing was terrible. One article in 12 months. Forgive me, though it is symptomatic of how busy the shop and hence me has been. And if i'm being honest I did drop the ball a couple of times last year, not just in the lack of blogs. A couple of modelling deadlines were missed for commision work, though I still feel it better not to rush when working on something and estimations of time are not an exact science so unexpected events can have a knock on effect. I was lucky to have Sophie, my daughter help out in the autumn and over Christmas, she has been a great help and wonderful company. She also surprised a fair few customers with the depth of her modelling knowledge. She and I used to build kits when she was young as father and daughter time when i'd return from being on tour or posted away from home. And dare I reveal she has attended shows and won awards when I have walked away with nothing. Sadley now she is a twenty something embarking on her future so model making does not feature in her spare time. Continuing the busy extra curricular events that having a model shop entails means so far this year I've not taken a full day off. Monday, (my closed day) has seen me in Margate and London as being involved in the industry does mean I get invited to the release announcments for each new year's range from the bigger names in the UK hobby world. To be honest I don't often attend, many items are nothing more than CAD illustrations, or re-announcments of items that don't appear for up to 3 years previous. This year I have in the end been hosted by Hornby and Bachmann in Margate and London respectivley. Both these names are familiar to model Railway enthusiasts but kit makers will be more interested in the Airfix (Hornby) and Pocketbond (Bachmann) elements, Pocketbond being importers for Trumpeter, Takom, Academy and many others. For the first Monday of 2019 I travelled to Kent the Sunday before so as not to get stuck on the M25 and was therefore one of the first to be shown around, even before the offical press release. This did mean I was asked not to photograph some railway items for fear of leaking it to the internet. The tight control of the release info showed just how dog eat dog the hobby industry really is as the security measure was related directly to other retail\manufactures that were competing to get products into the market place first. Hornby had a new Loco (known as a Terrier). It is not the first time they have made a Terrier, and the existing model was still decent. But Hornby had decided on a 3 year development programe to replace it with a more modern version. A well known retailer who also commissions Hornby's competitor to manufacture limited edition locos on their behalf had identified the potential gap in the market so set about beating Hornby to release a newer item. As locos are expensive, most people only buy a type once so being first out usually means the majority of sales. Hornby raised the stakes and hence the security, as they are now releasing the new Terrier in the first few months of 2019, 2 years ahead of schedule taking the first place postion when it comes to release dates. Apt being called a 'Terrier'; it is Dog eat Dog indeed. On the Plastic kits front there is a lot to report and I feel Airfix for once are getting everything right this year. Telford saw the 1/24 Wildcat announcement but additionally we will be treated to a brand new 1/72 Buccaneer, 1/72 Mig 17, 1/48 Tiger Moth. 1/35 scale military kits will appear in Airfix boxes, but are infact Academy offerings. 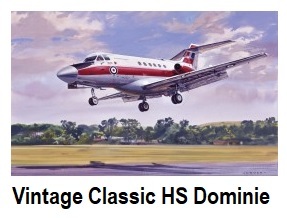 Airfix finally realise that a red box doesn’t mean new and won’t make up for an old crusty kit inside. So older kits are being packaged as VINTAGE-CLASSIC. It does mean the re-issue of some old kits that will be a struggle to build to modern standards but older genaration kit builders will love the Heron, Dominie and Jetstream being back amongst others. A week later it was hard to know how Bachmann, the owner of Pocketbond felt about this turn of events, they were tight lipped about things in general. The new 1/32 HK Lancaster was a jewel in their crown but for everybody present this was 'Old News' as it really belonged to 2018's releases. I am happy to say that Pocketbond in general are still receptive to modellers needs and desires regarding future model production. Big kits are still very much in vogue and we may see a 1/200 Titanic this year, another version of the 1/32 Lancaster and some amazing new models from Takom, the Frie Crane already appearing ahead of schedule. Another thing I cleared up by being able to speak directly to the management was Pocketbond’s announcement that a £12.00 fee would be invoiced to replace damaged / missing parts. Digging down this was not quite as black and white as the announcment had seemed. As a retailer I am trusted to know my customers and follow up problems, so no charge on shop related matters. The issue which has become a bigger deal in recent years is the number of second (or 3rd and 4th ) hand dealers who don’t care what state the kits they re-sell are in. I’m sure many of you have taken a purchase home whether from an Ebay dealer or an under-table sale to find an important part missing even if the box said complete. I regularly get asked in the shop to help, but I’ve had to reduce my helpful nature as tallies are kept on the stock sent out and the number of issues needing to be resolved. I was given a friendly warning that Salisbury Model Centre was sending parts and decal requests far more often that other shops in the Wiltshire and Hampshire area. No deviousness on my part, and perhaps reflecting a 'We Can‘t help' from some staff at other outlets, but it has meant having to turn down people who asked for help after their 'bargain' purchase has been started. Overall a good start to the modelling year on the retail front with much to look forward to, but for some big names a review of production times and costs may be due. The smaller companies don't have the oppertunity to do shows, but I keep a good relationship going with those I deal with, so hope to share with you some surprises from less well know manufacturers as we get them. For some big names based overseas, Nuremberg in Germany is where everything is revealed, and is in full swing as I write. Un-surprisingly being so busy also means no modelling of my own at present, though I did end the Autumn with some activty and Christmas brought some interesting things but more on that another time.... Happy New year and i'll post some pictures to go along with the ramble soon. A distinct lack of a blog this year, and not due to a lack of things to blog. Quite the opposite in fact with so much happening that it has been surprising looking back over the year so far. The year began with sadness knowing that Mr David Grove of Endless models, and one time owner of Salisbury Model Centre passed away after contending with two seperate illnesses. He was my competitor in retail but in reality we spoke 4 times a week and I was a customer of his when I moved into the area. We got on and I was glad to be able to attend his funeral in Febuary. The day went well but those present were surprised to find how much snow had fallen while we were inside. It made getting home difficult for everyone and led to me being closed for a couple days as we all had to contend with snow drifts. To be honest my Landrover could have got me in, but the roads were strung with abandoned cars and the streets deserted so it would have been pointless. I did use the time well as comissions needed attending to, more on those later. Feb moved straight into March and front page news with the Nerve Agent attack on 4th March against Sergei and Yulia Skripal, about 3 min from the shop in 'The Maltings' and possibly other locations such as Zizzi's restaurant. This was bad news for Salisbury and had a noticable effect on trade but we never missed a day trading as many customers refused to be intimidated by the media's sensational reporting. 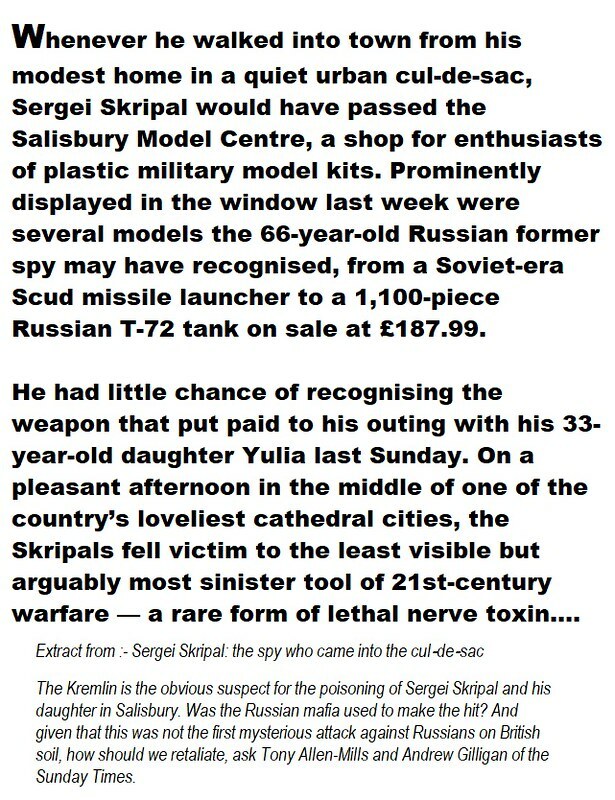 One surprising press article came from the Sunday Times as the opening paragraph of an in depth report managed to mention Salisbury Model Centre. The coverage was seen by a customer who let me know, and the beging of the article is reproduced here. It is no surprise that the reporters had noticed the Soviet era models on display as anyone who knows my own background as a MILAN Anti Tank operator while in the Army. AFV recognition was an important part of our training. If only we had access in the late 80's and 90's to the knowledge that is so freely available now. I do find myself stocking kits of Russian vehicles that proved elusive in my days of soldiering with only a grainy slide to try and work out key recognition features. 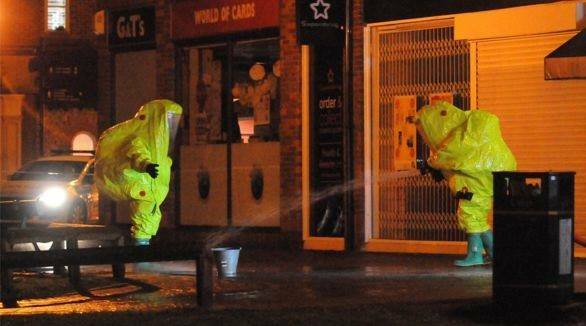 Sadly after enduring months of restrictions and reduced vistor numbers to Salisbury and just as things seemed to be returning to normal Novichok, the chemical agent at the source of the poisoning hit the headlines again. This time an incident involving the death of an innocent civilian who had found a discarded container the agent may have been transported in. The location was near by Amesbury, but the effect on trade was the same as the reports fueled the fear in some peoples minds that it is not safe to travel into Salisbury ( or even Wiltshire according to figures released by Tourism GB. The number of cancelled holiday trips to Wiltshire spiked after recent events making things difficult for Stonehenge and Salisbury Cathedral too). Commisions have been rife, as have repairs despite my decleration to stop taking work in. Thankfully having my daughter working in the shop this summer has given me some time to catch up. One of the earlier commisions this year was to build and paint some 28mm scenery made from laser cut MDF. A first for me, and very enjoyable. I kept to a limited colour range to keep the various buildings looking similar. They support 'Test of honour' a Samuri wargame so I wanted to keep it feeling oriental by using reds and gold. A dead Bonsai tree was 'upcycled' too. A more challenging request concerned the building of two 1/48 RAF twin engined fighters specifically to represent aircraft flown by Wing Comd Archie Boyd DSO DFC. 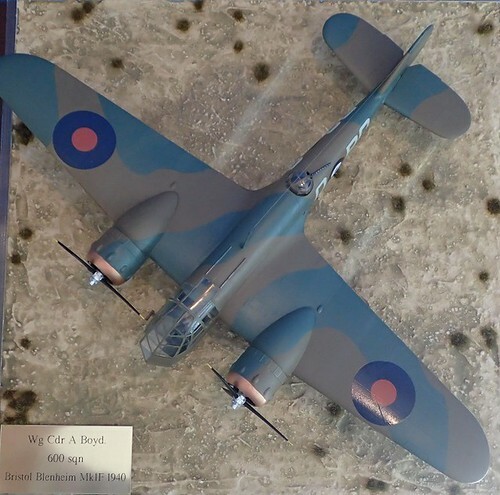 The Blenheim was a difficult build being the Classic Airframes kit that combined resin and plastic parts with decals made up to match the references available. That in itself was tricky as the aircraft I was asked to model was only flown for 9 days before being crashed. Despite a lack of exact references I was helped significantly by being provided with a photocopy of the pilots log book which had some serials still legible. 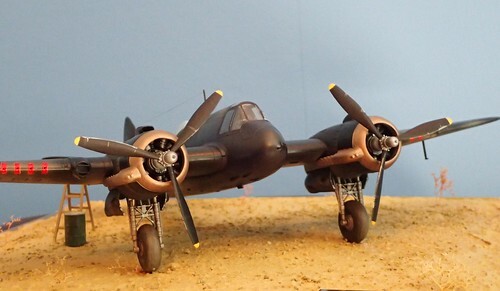 The Beaufighter was far more simple in construction being the Tamiya kit with new markings applied. Salisbury IPMS had its annual model show at the beginning of June. A great day for all who attended with visitor numbers higher than ever. I was there as a trader and also as a club member. For our in house Revell contest I made the effort to finish a 1/24 Corvette and mounted it on a simple base with a figure. I had stalled with this car kit due to getting an 'orange peel' effect on the gloss, ruining the body work's finish. I re-visited the model and using a cream polishing compound intended for real cars was able to buff back the shine. Ironically in the end the smooth shiney body I had worried long over was then over sprayed to weather it and make it seem as though the car was in mid wash.
One slightly bitter sweet Club matter was the handing over of responsibilty for the club's web pages. For the last 5 years i'd hosted IPMS Salisbury's club web pages and edited updates, events and pictures. The club had prior to this relied on outside agents who had proven to be very unreliable ( expensive set up fees then months between updates- be warned any club or private individual relying on a 3rd party to look after your site- it is easy to be left frustrated). The new Club Chairman took over the Club's web presence and a totally independant site was created that also promoted the annual show. I won't totally remove the IPMS SALISBURY presence, and the button on this page's drop down menu will remain but it won't be updated often, just the galleries kept current. For IPMS SALISBURY matters click here. Regarding the in house Revell contest my Corvette didn't place, but it was fun to enter. The winner was Tod, an American club member who co-incidently appears below in the stars and stripes tie. He helps me out on occasion in the shop so you may bump into him. 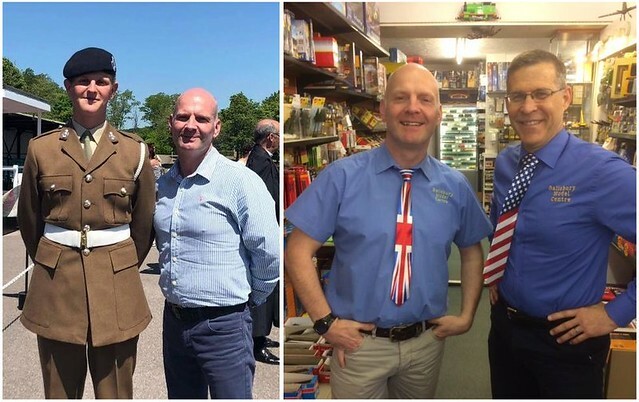 The reason for the patriotic ties was the Royal Wedding held on 19th May. It was a great day with many people up and down the country having parties and events. We decorated our window with Red Arrows flying smoke into a heart shape, it drew a lot of comments. We also had a royal visitor in Salisbury when Prince Charles and his wife came along to give businesses effected by the Nerve Agent attack a boost. Despite us having kits of the Apache for Harry and Wessex for himself, Charles didn't pop in to the shop. Having Tod helping out makes up for the loss of Dan, the young lad who has been working Saturdays at the shop for about 3 years. He decided to give Army life a try and enlisted into the Royal Armoured Corp. I was pleased to be invited to his pass out parade on the 29th June. This turned out to be a close call as the NHS rescheduled surgery for me on Monday of the same week. Thankfully it was a painless operation and after 28 hours I was able to spring myself out to be able to attend and be back in the shop the next day. I do want to thank my Wife for looking after the shop and customers during the time I was convalescing. What she dosn't know about Model kits she makes up for in good looks. Events in Salisbury including Steam arrivals. Note, this service is aimed at providing information of interest and you are strongly recommended to find more specific detail from the relevant agency. Links will be provided where able. Do not plan any trip solely from the information herein, SMC will not be held responsible for cancelled events, timing changes, address errors etc as no announcement herein is the property of SMC but taken from the originators detail. We do hope however that you discover events in the area that you may have otherwise over looked. Events are listed in chronological order. The DDWG meet Sunday afternoons between 14.00hrs and 18.00hrs at 1st Devizes Scout Hall, 15 Southbroom Road, Devizes. SN10 5AD. There is a yearly subscription but the first 3 visits are free to give a taster of the wide variety of games played at the club. Tel 01865 407365 for booking or check Pendon web site. 13 Jan 18 The news coming out of America is Hobbico, the RC giant that recently bought the German element of Revell has filed for bancruptcy. With Revell's new Catalogue due very soon, that news has raised some questions amongst customers. Be assured the kit side of Revell is safe and Revell GmBH will not be effected by the news. In italics below is part of the formal statement that was issued by Revell UK. I hope you will join me in wishing Revell good luck for 2018 and that the employees of Hobbico don't have to much anguish over the coming months. "We would like to inform you today that Hobbico, Inc. announced this week that it has filed for restructuring under Chapter 11 of the Bankruptcy Code in the United States. Hobbico also announced its plans to sell the company. 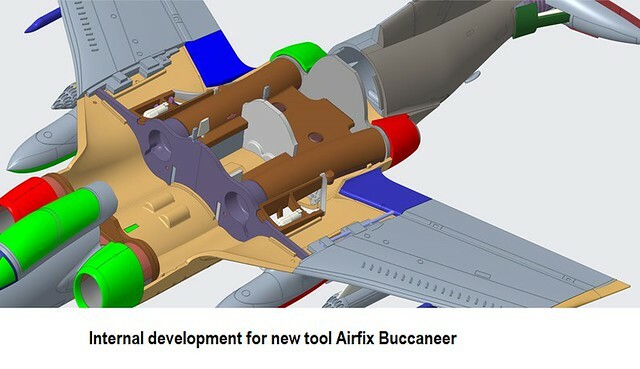 The company is already in the process of actively exploring prospective buyers, but it is too early for further detailed information whether Hobbico will be sold as a whole or be split into parts. Revell UK is NOT part of the bankruptcy filing and will continue to operate its “business as usual” moving forward. We do not expect disruptions in the daily business with our suppliers, customers and other partners as Revell operates independently within the Group and has no organizational dependencies. Our top priority remains to offer our customers the best products, the best possible service and to continue to grow our business, like we did for another consecutive year in 2017." 03 Jan 18 Expect some interesting new releases from Revell this year as well as a wide number of reboxes from ICM, Eduard, ACE and Zvezda. While there has been an overall price increase in Revell's kits many of the reboxed kits are less than the orginal cost. Also annonunced but as yet no picture or price details are models from the new Star Wars spin of Filn :- Han Solo. 05 July 17 Price increases on a lot of items that originate from across the pond in the good old US. You will see prices on WOODLAND SCENICS, PLASTISTRUT, K & S METALS and WALTHER jumping. I will only do this as new stock arrives so expect to see different prices on items even if they appear to be similar, it gives you the chance of grabbing last years price for a bit longer. My own pictures for you to use to detail your models or for interest. Challenger 2 Main Battle tank of The British army. Dardo IFV of the Italian army. M1/M1A1 Abrams. US Main battle tank. Cobra. US attack helicopter being recovered in Iraq. VAB Wheeled APC of French Army. RAF Calf Tractor Tiny tracked vehicle used to clear snow in WWII on RAF runways.